Piercings have been around since time immemorial, as a beauty statement or a religious practice. Ears are a favorite body part when it comes to piercing, and there are multiple styles and combinations to experiment with. From the good old Earlobe piercing to the Suicide and Industrial, there’s something for everyone. A good understanding of the technical names and positions of piercings is a bonus; you’ll know exactly how to care for it and the kind of jewelry you can buy. The simplest, an earlobe piercing. The earlobe is the fleshy lower part of the ear. Piercing the lobe is a pretty common religious obligation in many communities too. 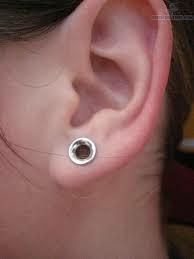 It is one of the easiest forms of piercing since the earlobe flesh is extremely soft, and heals fast. On average, it takes 6-8 weeks for it to heal completely. However, it is susceptible to infection if proper hygiene is not maintained. 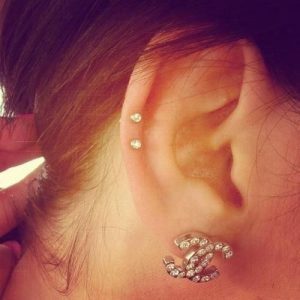 The USP of this piercing is the possibility of sporting anything from petite studs to heavy danglers. The upper earlobe piercing is a perforation made few millimeters adjacent to the first lobe piercing. The soft flesh makes piercing easy and painless. A good combination of accessories for both the piercings adds glamour to the look. Helix is the upper cartilage of the ear. 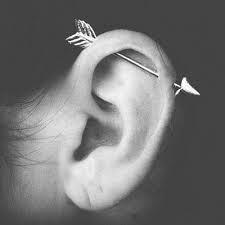 There are no nerve endings in this area so piercing is not painful at all. However, it takes more time than an earlobe piercing to heal. 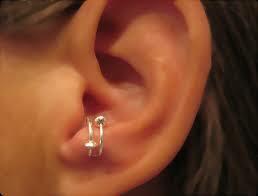 It is also referred to as the ‘Pinna’ piercing. 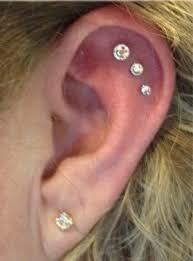 A helix piercing is a good option if you wish to get something different but aren’t ready to experiment much. Small loops and rings work as the best accessories. 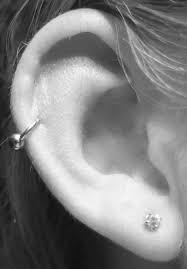 A variant of the helix piercing, it is done at the spot where the upper cartilage curves down towards the head. Being a cartilage piercing, it is low on the pain scale, but requires adequate care till it properly heals. 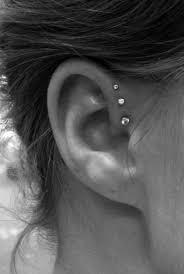 The more bold variant of the helix piercing, three adjacent perforations on the forward helix. Go for this look if a simple helix doesn’t satisfy you and you need something more unique to your taste and personality. The auricle is the middle portion of the ear cartilage, between the helix and earlobe. 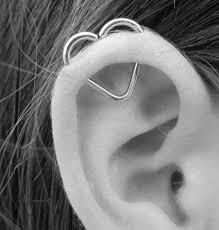 There is not much difference between the helix and auricle apart from the position of the piercings. 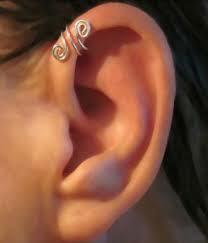 It is a favorite trend among youngsters owing to the variety of jewelry available for this piercing. 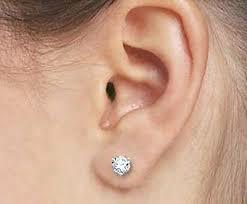 Tragus is, by definition, a prominence on the inner side of the external ear, in front of and partly closing the passage to the organs of hearing. It is a unique area for piercing and the experience isn’t very painful too. Another big advantage of the tragus is that it heals quickly. Outer cartilage piercings tend to get tangled with hair or earphones, so this piercing is a fantastic choice for experimentation but without any hassles. Step up the tragus game with a double piercing. Two separate accessories can be worn in each of the holes, or a ring/barbell can be worn connecting them both. A double tragus requires a lot of care and attention in the initial months since there is a risk of infection spreading due to the proximity of the piercings. An anti tragus piercing is done on the protruding cartilage between the tragus and earlobe. It can be painful for some people and requires adequate care for the first few months. Anything from small studs to loops can work, depending on how well you can carry it. If you desire something bolder, try a double anti tragus. An earhead piercing is very similar to a forward helix, but closer to the end of the cartilage curve, near the facial skin. 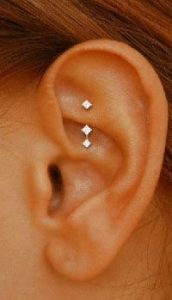 It is the perfect spot to sport a dainty diamond, or for the more wild; connect it to a helix piercing using a common accessory, forming a straight line from one end of the ear to the other. Like any other cartilage piercing, it takes 3-9 months to heal completely. The rook is the ridge between the inner and outer conch of the ear. A rook piercing goes in from one end and comes out the other. It is comparatively an uncomfortable piercing due to its peculiar position that makes it difficult to align the entrance and exit holes properly while piercing. It can be painful and is pretty inaccessible if you wish to change jewelry frequently. With well chosen accessories, it becomes a statement in itself. 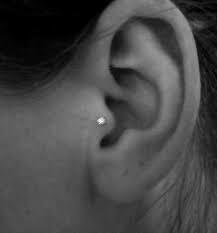 A Snug piercing is done in the innermost ridge of the ear cartilage, between the rook and anti tragus area. It is an extremely sensitive part and because of the thick cartilage, piercing can be difficult and painful too. It takes a minimum of 6 month to heal and tangling with hair or earphones needs to be taken care of. Not for the fainthearted, this is a combination of the Rook piercing and Snug piercing. 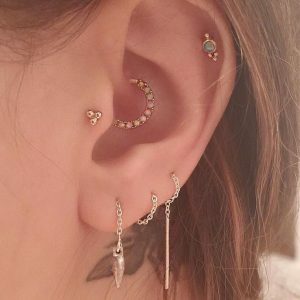 Separate earrings can be worn in each or a barbell connecting both of the piercings can be worn too. 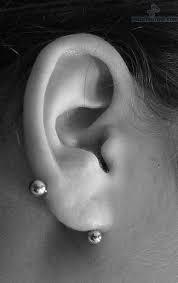 It is very close to the innermost sensitive parts of the ear and should be properly taken care of. 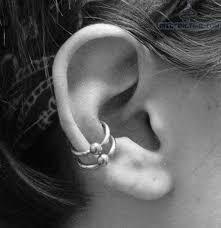 The Daith piercing is made in the inner cartilage fold, between the tragus and earhead area. It is a sensitive area for piercing and is in close proximity to the inner ear, but there have been claims that it acts as a pressure point for healing migraines. It is also one of the most painful of piercings, so you better be certain before you go for it. The outer conch is the flat area of cartilage between the rook area and helix. Like any other cartilage piercing, it lies low on the pain scale. For a wilder look, get multiple adjacent piercings. 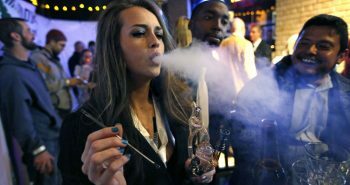 The best part about it is that it gives a very distinctive look but without any unnecessary pain, attention or nuisance. The inner conch is the curved area in the middle of the ear, leading to the ear canal. The cartilage here is harder than the outer conch and hence piercing can be painful. It is situated very close to the innermost sections of the ear and hence requires maintenance. Like the outer conch, multiple piercings can give a more unique look. 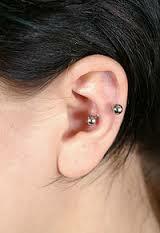 A variant of the Inner Conch Piercing, a double conch piercing is done by piercing two holes adjacent to each other. It is mostly done for wearing loops in each of the holes that cover the outer and inner cartilage ridges of the ear. 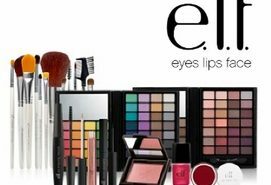 It is one of my personal favorites and adds much zing to the appearance. 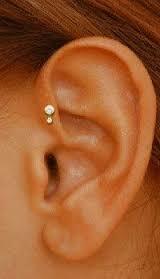 This piercing is made in the middle of the soft outer edge of the cartilage. Not much different from an auricle, it is a painless perforation. It is an elegant style if the jewelry is chosen well. Multiple piercings give a more vibrant look. 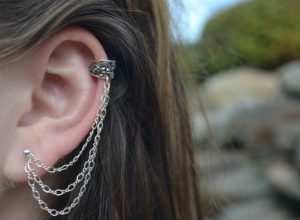 Ear cuffs are in vogue right now, with various options available for those who wish to experiment. An ear cuff piercing is done in the helix area with the specific intention of wearing an independent ear cuff or one that is attached to the earlobe piercing. Orbital piercing, as the name suggests, is done with one ring through two piercings such that it appears like a circular orbit. 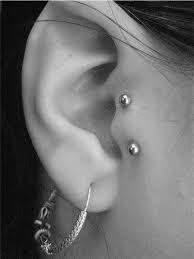 It is primarily done in the helix area, but can also be done in the earlobe area, or even the conch area. It may or may not be painful depending on the area of piercing. Orbital is a flattering choice for youngsters who want a more quirky piercing. A Transverse is done horizontally through the lobe, rather than front and back. Since the earlobe flesh is very soft, it is mostly painless. If simple lobe piercings bore you, this is the one for you. 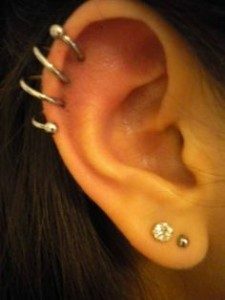 An Industrial Piercing refers to two piercings on the upper cartilage, with a common accessory or piece of jewelry connecting them. Since the cartilage is pierced, it is not very painful but needs attention as it can get tangled with hair or hair accessories. An Ear Cage piercing is a combination of multiple industrial piercings in a way such that it forms a crossed design. For those who aren’t satisfied with simple industrial, ear cage piercings are the next level of awesomeness. 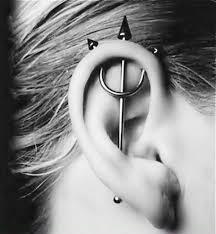 Handle it with care since there is a possibility of it tangling and stretching all the piercings together. Ear weaving is done by making multiple piercings adjacent to each other, on the outer cartilage. For those who want an extra oomph to their helix piercings, this is a great option. A proper fitting piece of spiral jewelry is essential since a lot of movement may cause infections or delay the healing. Three adjacent earlobe piercings give a more untamed look to the simple ear lobe piercing. Correct accessories can enhance the appearance. 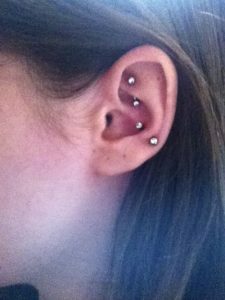 Choose this if you want to be adventurous but aren’t sure about handling all the pain and maintenance that comes with most of the peculiar and quirky piercings. If done well, graduated piercings are one of the most beautiful styles. 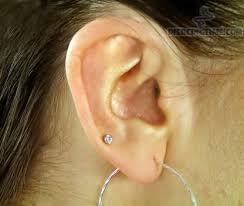 It starts from the earlobe and extends upwards to the cartilage. 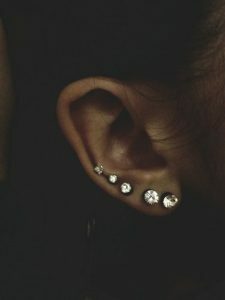 The first is usually the ear lobe piercing and the last may be till the middle of the ear or the upper cartilage curve. A benefit of multiple piercings is the combination of accessories that can be worn at the same time. Gauging refers to stretching of a piercing for body modification. The magnitude of stretching is dependent on whether the person wants the piercing to shrink back or stretch further with wider jewelry. Gauge Piercings generally do not take a lot of time to heal, but shrinking may take time. If you are okay with high maintenance and a different body modification look, go for it. 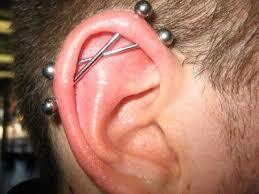 Suicide Piercing is basically an industrial piercing except that it is done vertically. The one in the picture is one conch piercing and three helix piercings for a devilish look, literally. It is an extremely uncommon style but if you desire something absolutely unconventional and are ready to provide it with adequate attention, Suicide Piercing is one evil option. If you aren’t sure about what is right for you or you want a combination of many, here’s you cue. Get a multiple of these piercings and try out all possible combinations of jewelry. The finest advantage is that you can have a different look every time you step out!